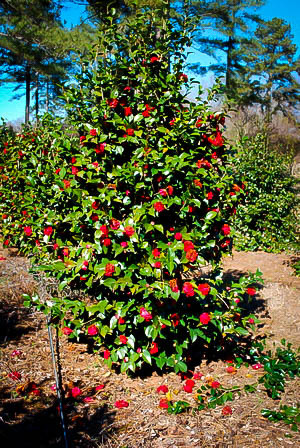 The Professor Sargent Camellia is one of the best forms of Japanese camellia available. 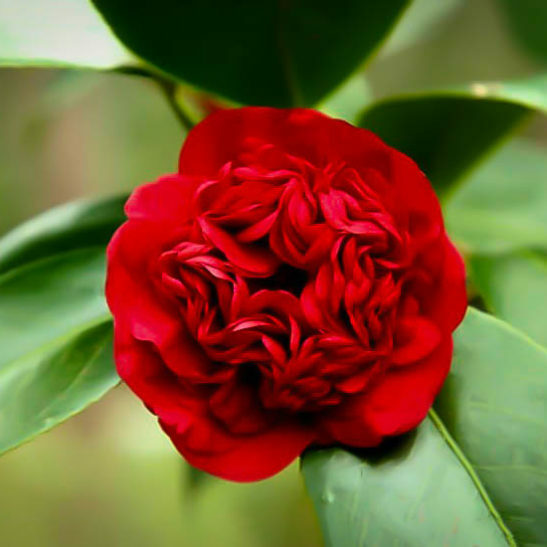 Its spectacular rich red flowers, their many petals forming a whorl of color, bring interest to the garden in winter and very early spring, when nothing else is blooming. The rich-green, glossy foliage is evergreen, and the dense conical form is ideal for planting among other shrubs in beds, or as specimens. 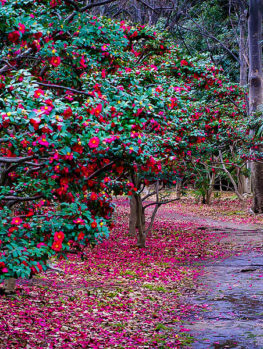 Grow in a woodland garden beneath trees, with other plants like azaleas, gardenias and Japanese maples. They also make lovely plants for pots, where they will grow for years, and they can be moved around to best enjoy them at different seasons. They fit well in any style of garden, from an Asian-inspired one, to a woodland garden, or a more formal setting. This plant can be grown as a beautiful specimen in a shady lawn, or among other shrubs in a mixed border. 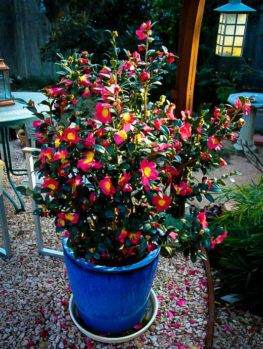 Choose a partially-shaded spot to grow the Professor Sargent Camellia. Shelter from afternoon sun is best, and the shade beneath tall trees is ideal. It will grow best in acidic soil, but it can be grown in most moist, well-drained soils of any type, if you use chelated iron regularly. In pots, always use a lime-free potting soil and fertilizers for acid-loving plants. Never lets plants become completely dry, although mature plants have some resistance to drought. They have no major pests or diseases and once established these plants need no special care or attention at all. Camellias have been described as the ‘Rose of the South’, but they grow well in other areas too, and by growing them in pots they can be grown in many different parts of the country. The Professor Sargent Camellia is a classic, well-established variety known for its great beauty, vigor and ease of growth. 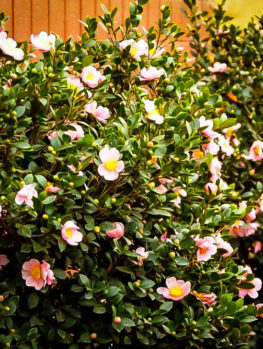 It develops quickly into a bush that may be 10 feet tall and 6 to 8 feet wide, with beautiful rich-green, glossy leaves covering the plant from the ground to the top. The leaves are 4 inches long, and oval-shaped, coming to a pointed tip. 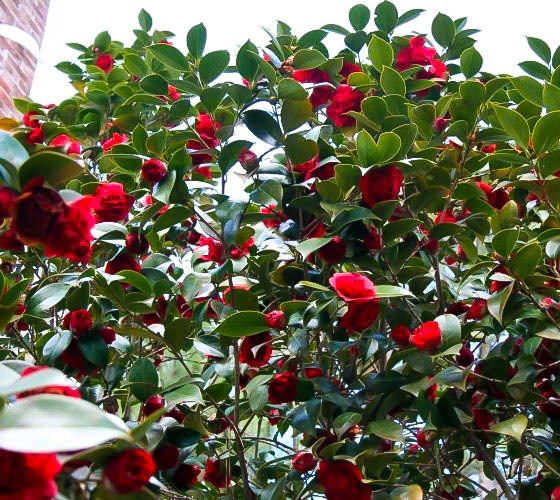 The bush of the Professor Sargent Camellia has a dense, conical shape, and in winter and early spring, it carries many beautiful, rich-red blooms. These are 3 or 4 inches across, with an outer circle of 12 petals containing in the center a profusion of small petals curled and rolled together to make a dome. 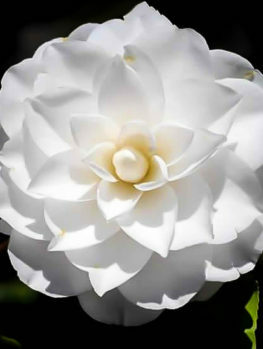 In the camellia world, this flower shape is called ‘elegans-form’. There are over 200 petals in each flower, and the color varies from rose-pink to a rich dark red. 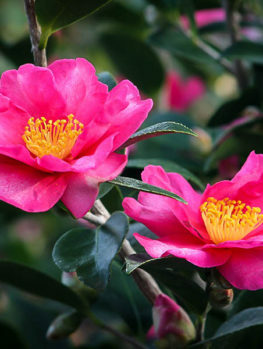 Grow the Professor Sargent Camellia among woodland plants, especially Rhododendrons and Azaleas, but also Japanese Maples. All these plants thrive in the light shade beneath deciduous trees, or in the shade of buildings. 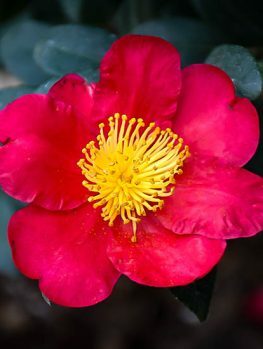 Like other varieties of camellia, the Professor Sargent Camellia grows best in acidic soil, but even if you do not have this type of soil, they can be grown successfully in the garden using regular treatment with chelated iron. Plants in the ground can tolerate short periods of temperatures below freezing. Another way is to grow these plants is in large pots, where they will thrive for years. The pot should have sufficient drainage holes, and you should use a soil for acid-loving plants. Follow a regular fertilizer program, also using products for acid-loving plants. Growing in pots also means you can grow this plant in colder areas. You only need a place like a porch or glassed-in terrace to keep it during the coldest winter months, when temperatures are almost or below freezing. Plants will do best in cold rooms, not in warm rooms with central heating, although they can be brought inside for a short time when in bloom. The Professor Sargent Camellia also makes a wonderful screen or informal hedge. With its naturally dense form, it needs no trimming or pruning to provide solid screening. Plants can be placed 3 feet apart, and they will soon fill in and form a great barrier that will look good all year, but amazing when in flower – just at a time when other plants are dormant. If you do prune, do it immediately after flowering has finished, so that the bushes have plenty of time to develop flower buds for the next year. Regular mulching with rich, lime-free organic material will not only conserve moisture, it will keep the roots cool and provide nutrients too. 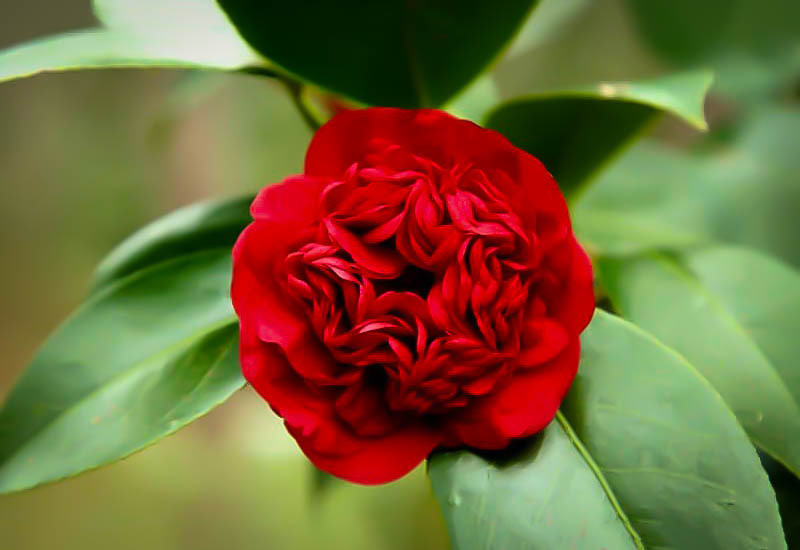 The Japanese Camellia (Camellia japonica) is a native plant from China, Japan and Korea. It has been grown for centuries in gardens there, and many varieties were developed. These caused a sensation when brought to Europe, and the first plants arrived in America around 1800. They were grown first in Charleston, South Carolina, and from there they were taken to other suitable areas. Many hundreds and even thousands of varieties exist, but many are very similar, often with slow growth, and with few outstanding features. Of the few that are truly outstanding, the Professor Sargent Camellia is high on the list. The exact origins of the Professor Sargent variety are not clear, but it probably came into America around 1900 from Seidel Nursery in Germany. It was imported by Berckman’s Nursery, Augusta, Georgia, and named by the Rev. John G. Drayton in tribute to Professor Charles Sprague Sargent, who was the Director of the Arnold Arboretum at that time. Sargent was responsible for introducing many plants to America from China and Japan. 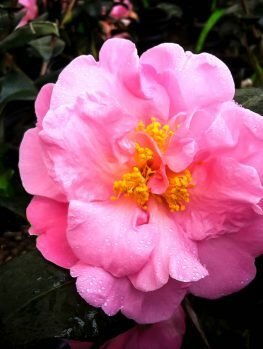 Camellias are wonderful plants, and they should be in every garden where they can be grown. Once established they need no special care at all, so they are always popular with gardeners, and in high demand. This is one of the best varieties available, and we have a good supply of quality plants. However, we know just how popular they will be, so order now while our supply lasts, because we do not know when we will be able to source this plant again. 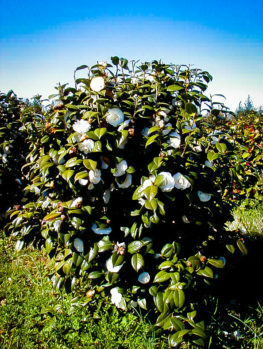 If you like this plant, you should also consider other varieties, such as the White By The Gate Camellia or the Kanjiro Camellia.